Do you know a kid who is a mini version of some of the great chefs you see on television? 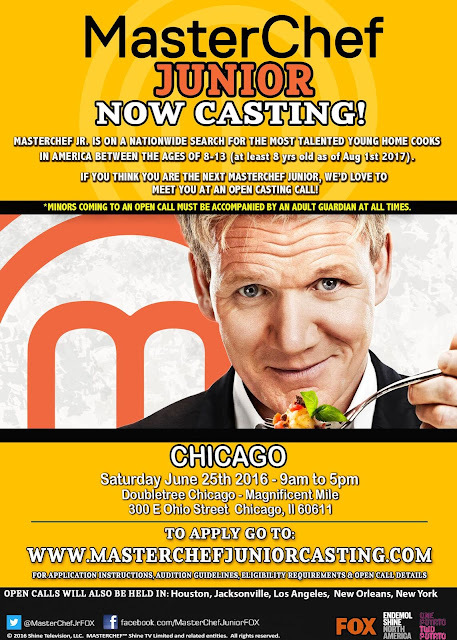 They'll be happy to know that casting directors are looking for junior culinary masters for the next season of taping for MasterChef Junior. Open casting calls take place tomorrow in Chicago at the Doubletree on the Mag Mile from 9 a.m. to 5 p.m. Scroll down for more details and some insight from the casting directors on what they're looking for and what they've encountered so far. Chicago Foodie Sisters threw out some questions to casting director Gina Gonzalez to get an idea of what it's like selecting participants from the show. CFS: What are some specific qualities you're looking for in kids to appear on the show? Kids that are very passionate about food and cooking! We're looking for kids that love cooking so much that they would love the opportunity to learn as much as they can and grow as better cooks. MasterChef Junior is a true culinary journey so we're looking for kids that have the passion and the potential to become great little MasterChef Juniors! CFS: How impressed have you been with the kids you've encountered so far? That's a hard one to answer - over the moon impressed! We've been blown away by the kids that come out to audition every season. It really is incredible what some of these kids are capable of - a lot of them are already much better cooks then their parents! CFS: How many cities do you hold the open casting calls in? Are there any cities that seem to produce more talent than the others or where you think the kids just get the most exposure to many culinary cultures? We go to 6 different cities across the country. Every season we usually always visit New York, Chicago and Los Angeles - they're all big cities and fantastic food cities so kids there are usually exposed to all different kinds of foods. CFS: Any auditions that have been extremely memorable? Honestly, anytime you can watch an 8 or 9-year-old cook a complete meal that not only smells and looks good but tastes great, it's something to remember! CFS: What are some of the most creative dishes you have seen made by these mini-chefs? We've seen kids cook all kinds of great things - from Duck a' l'orange to Chocolate Molten Lava Cake to Lamb Chops - it's been quite amazing. CFS: What are the perfect ingredients that indicate to you that a kid will be a perfect part of the show? Kids that are EXCITED about and for the opportunity, and kids that are happy to share their love of food with America as well as share a bit of their lives with us.